This tutorial focuses on setting up attacks (for real time battles) with weapons for our little game – if you want to learn more about damage dealers/zones and doing damage in general, you can read this how-to. A damage zone is a simple component that allows receiving damage from damage dealers. Damage zones are added to the prefabs of our combatants – you can add multiple damage zones to create vulnerable areas on your combatants. This will add a Rigidbody component and the Damage Zone component (with damage factor 1) to all prefabs. A damage dealer is a more complex component that deals damage to combatants with damage zones attached. Damage dealers need to be set up for certain actions and activated by them to actually do damage. Like with the damage dealers, this will add a Rigidbody component and the Damage Dealer component to all prefabs. The weapon prefabs should already have a BoxCollider (using Is Trigger) attached. Now we need change the following settings on all three prefabs. The damage will be dealt when a damage zone enters the trigger. We’ll use the Auto Activation in combination with Tags to activate our weapon’s damage dealers in battle. This will enable auto activation in real time battles. Deactivate the other battle types (Field, Turn Based, Active Time and Phase). Click on Add Tag to add an activation tag. The damage dealer can be activated by specifying this tag. Our weapons are now set up to be automatically activated in real time battles when using the weapon tag and will deal single damage to one target. Remember to repeat these settings on all three weapon prefabs. Since we’re using the damage dealers to do damage in real time battles, we need a new battle event that isn’t using the Calculate step. The battle event wont force a calculation (since we’re doing this with damage dealers). This setting is by default disabled. The battle event will use auto activation for damage dealers. This setting is by default enabled. We’ll play the attack animation. Add a short wait time after the animation. This is simply a timeout to slow things down a little bit. That’s it for the event – click on Save Event and save it as attackNoCalculation in Assets/Events/Battle/. Now, all we need to do is add some things to our attack abilities (Attack, Mug Attack) to use our new battle event in real time battles, and to activate the right damage dealers. Navigate to Status > Abilities and change the following settings for Attack and Mug Attack. We already have three battle events added to the abilities. Change the following setting on all three battle events. This means a real time battle wont use those events. Now, click on Add Animation to add a new battle event. Enable Real Time, disable the rest. These settings determine which damage dealers will be auto activated by the ability. Click on Add Tag to add an activation tag. All damage dealers on the ability’s user with a weapon tag will be activated – this also means weapons displayed by the Equipment Viewer. We can add a sound and a prefab to the damage dealers – they will be used on the combatant that was hit by the damage dealer. 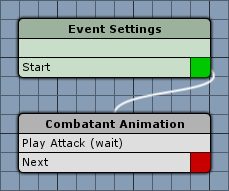 First, we’ll set up the sound – we’ll use similar settings to the attack battle event we created in a previous tutorial. This will use the target’s defined audio clip. Now, we’ll set up the prefab – again, similar to the prefab used in the previous attack battle event. We want to stop the particles before destroying the prefab, this ensures a better visual effect. And that’s it for now – the next lesson will cover control maps.